After an accident occurred in the SERN (South East Nuclear Research Center) facility in 2047, our heroes travel through time against their will. As time runs backwards and you will have to find a way to return to the present trying to break the chain of events that caused the accident. You’ll play in an immersive world with three characters (a scientist, a reporter and a secret agent) travelling through time from 2047 to 100 years backward. You will find yourself in a race against time, fighting the guardians of time and the secret services. Some main events: Wikileaks (2010), Twin Tower Attack (2001), Kennedy Assassination (1963), Roswell (1947). The game is developed by Meangrip. 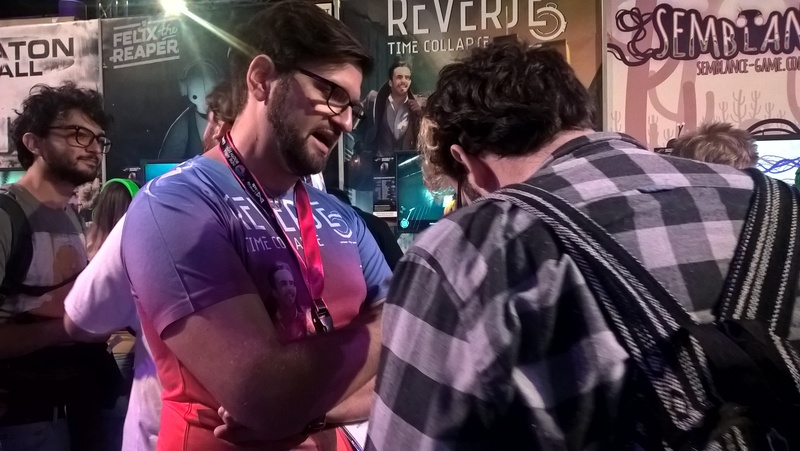 We had the chance to find the developers of Reverse: Time Collapse during Gamescom 2017 at their booth (located at the Indie Arena Booth) and talk to them a little bit, finding out a bit more about the studio and the game itself. We talked with Carlo Cuomo who is the lead designer and supervisor of the project. We were told that the development studio is based in south Italy, near Napols and is comprised of six people. The studio though has a long story, starting with the company of Netmines, which is mostly focused on AR, VR and e-commerce projects. Around 2009, the company started experimenting with Unity a bit more and soon enough, it was decided that they should start making a game. That is when the development of Reverse started and it started as a research project at first. Rocco Paladino, also part of the development team, is the original creator of the game’s story and it can easily be seen through the game that he, as a writer, has a huge love for cyberpunk, sci-fi and other science influences. “The game’s development was halted a few months ago but we recently decided to pick it up from where we left it and actually finish it,” said Carlo. Carlo explained that he is actually a teacher at an Italian university for game design and after finding some students that were interested in the project, he formed the team that is now developing the game. The game will be a third person adventure ame with a lot of mechanics that interact with the time that play a major role in puzzle solving. There is actually a mechanic that the developers call the “metaludic” and is connected to the fact that you can interact with time. There is an application that the player can download on his phone to check on various events that have been affected by the time travelling complications that have been created due to the game. “It is more like an AR experience as well because of the application,” said Carlo. You can actually prevent various events of huge historical importance from happening, ones like the J.F. Kennedy assassination or the twin towers attack. The studio is planning on publishing in October and there are also plans for launching a Kickstarter through which backers will be able to get early access to the game and its content before it fully releases. Carlo closed the interview by telling us that the studio would love to have the game ported to consoles if it fits in the future. You can learn more about the game through its Facebook page and website.